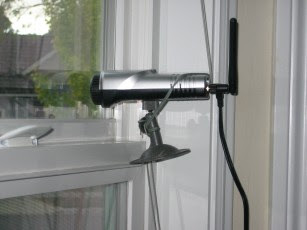 I have had this wireless webcam monitoring my front door for over a year now. The idea was to be able to see who was there before I opened the door. It also would send a picture to my email account whenever the image changed. I.e. whenever someone came to the door. It has been sitting there sending video to ether for most of the time. 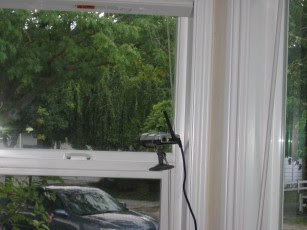 So, I decided to place it so I can see out front and down the street where the kids play. I can sit at my computer and watch the video. I started messing around with ait a little and figured out how to grab just a single image from the camera. Sweet! So, On my webserver (a laptop sitting on the desk) I crated a quick program to grab the current image and save it as a picture. I then made a quick web page that refreshed every minute since I take a picture every minute. Viola! Instant web cam. Now, of course nothing is perfect. For example, I really do not have a good place to put the camera. But I do have a knack for doing some really hick things. I am sure my wife will agree, this is one of them. You be the judge! OMG...the camera dangling from the blinds is certainly a sight to see!